Looking for the easiest way to type in French on your keyboard? Writing in French no longer has to be an arduous task. ... and so on. Same goes for all french accented letters. All you have to do is press the same letter on your keyboard a few times to get your desired accent. That’s it. Enjoy! is your best companion for typing in French, it is absolutely unintrusive. Want to type in French? Select Turn ON from the icon menu. Switch back to English? Select Turn OFF. You also have the option to Exit Completely the program until you type in French next time. It’s that convenient. Purchase this innovative software for only $9.99. That’s 50% off the original retail price of $19.99. Limited time offer. One-time payment. No recurring fees. You may Download a Free Trial to assess its full range of features and benefits hands on. You may also have fun testing it online while typing your French text on our free Online French Keyboard. is unquestionably the simplest and easiest solution currently in the market to type in French on Windows. Cliquez sur le site français Taper les accents français en toute simplicité est désormais possible. Il suffit de taper sur la même touche deux fois, trois fois, quatre fois... pour obtenir l'accent désiré. Rien de plus simple. Follow the blog of Isabelle Jones, Head of Modern Languages at the Radclyffe School, for valuable resources and a wealth of information for French and Spanish teachers. We offer substantial discounts for educational institutions and businesses. The EasyType French Accent program has made my life as a french immersion student 100% easier. 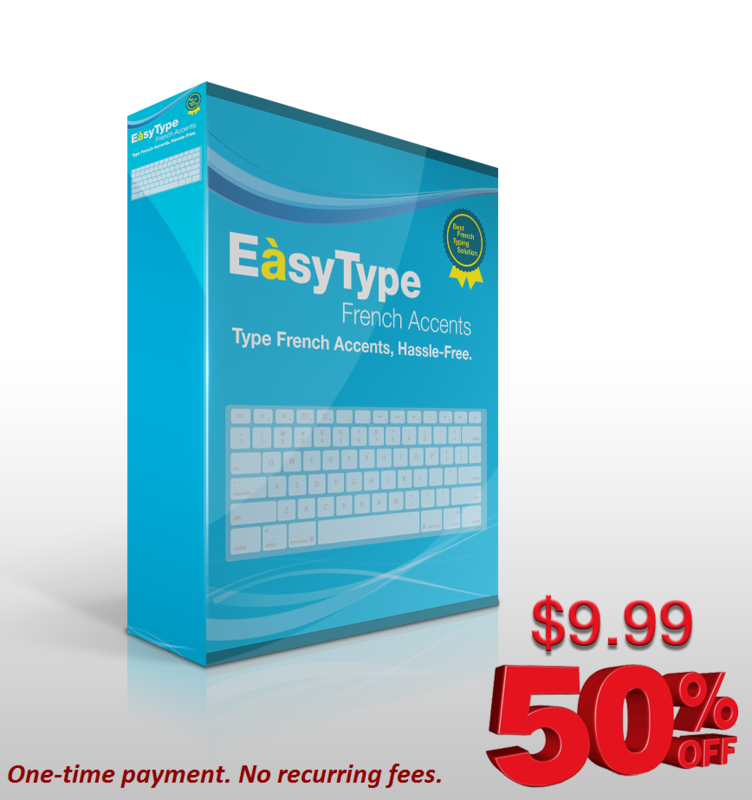 It helps you type French accents, hassle-free! No more ALT+ number. It is a great program that you can adjust to very quickly. Thank you for offering such a wonderful program! Je suis satisfaite de ce nouveau logiciel car il permet d'écrire rapidement un traitement de texte!! Pour les étrangers à l'étranger, je pense qu'il sera parfait pour écrire des mails à destination de la France!! Éclatez-vous!! — No more combination keys or Alt codes to remember. — No more keyboard language settings. Note: To type the identical letters ée, ee and ii, simply type the first letter, press and release Shift, then type the second letter. lets you type French accents everywhere: in word processors, e-mail, instant messaging, social media, web browsers, spreadsheets, online forms, databases, graphics and multimedia applications, and any other application where you can enter French text. Works with Windows laptops and desktops. It is designed for users of all ages, typing abilities, and French levels. All you do is type the same letter 2 times, 3 times, 4 times… to produce the French accent you want. That's all. For example, to type é just press e 2 times. Even young children can start typing French accents with ease as no complicated tutorial is needed. You type your French text intuitively and comfortably regardless of your typing skills, and you keep your current keyboard language layout. Download a Free Trial, or type your French text on our free online French keyboard at TypeFrench.org to see for yourself how simple typing in French can be. It saves you valuable time and increases your productivity by letting you type French accents faster. It eliminates finger and hand travels across the keyboard since there are no combination keys to press or hold. You keep your eyes on the screen, and you concentrate on your thoughts, not your fingers. This software is tailored to the French language as the most frequent French accents are the fastest to type. It is helpful to anyone who types in French, especially in schools, institutions of higher education, elementary and secondary French classrooms, special education, and assistive technology settings. It frees students to focus on improving the quality of their writing without the distractions of awkward key combinations and numeric codes. A French typography feature even simplifies typing French punctuation marks, thus providing a full typing experience in French.